I have shown a good number of surfing photos from Langosta Beach lately, so I decided to post today a photo of part of the view of Langosta Beach from our condo. This is the view looking north up the beach rather than straight out to the ocean. It is so pleasant to have breakfast, or any meal, while listening to the surf and feeling the ocean breeze. World Cup News: Yesterday Costa Rica defeated Greece in the round of 16 in the World Cup football/soccer matches. It is a remarkable achievement that Costa Rica could advance to this level, ahead of Italy and England in its bracket, and now moving on to the quarter finals. The entire country is excited. Today is Sunday so we have new photos posted on our Viva la Voyage travel photo site. This week we are showing photos from our trip last month to Majorica, a diverse resort island in the Mediterranean. 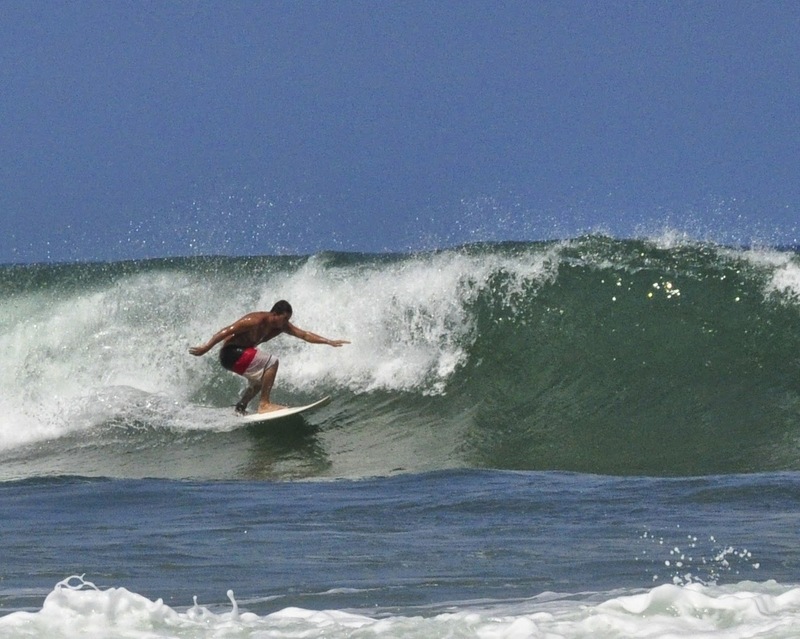 The posture of this surfer looks like he may be trying to trying to mimic the posture of some ancient Egyptian figures. Sometimes the waves roll in with such frequency that the interval between the waves seems to disappear. 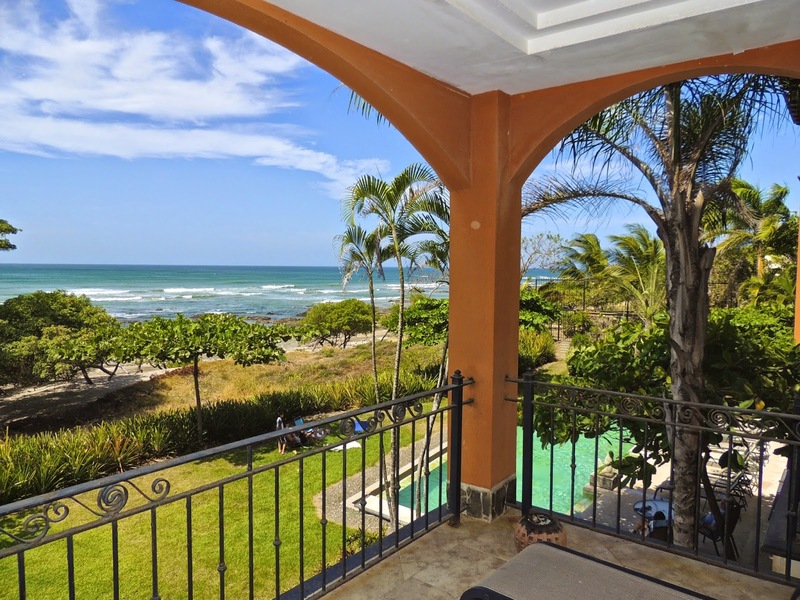 We like the fact that from our Langosta condo we can hear the constant rumbling of the waves. 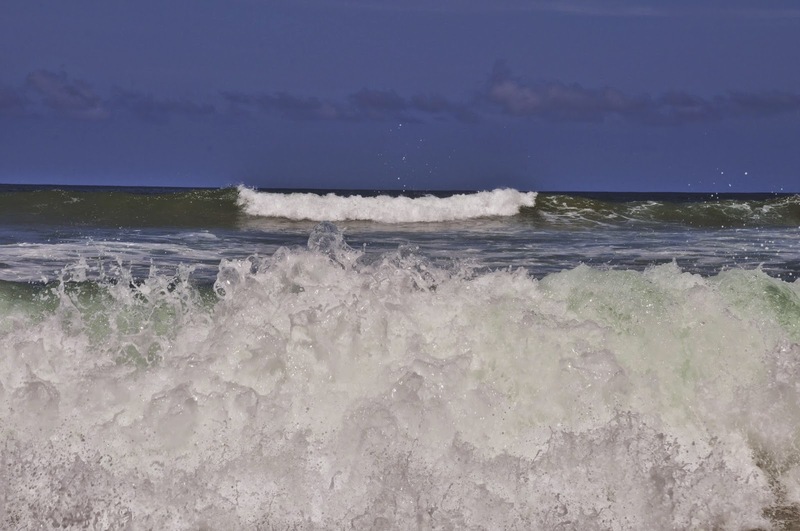 This is a wider view of the waves at Langosta Beach. This also shows a view of the typical morning weather at this time of year. 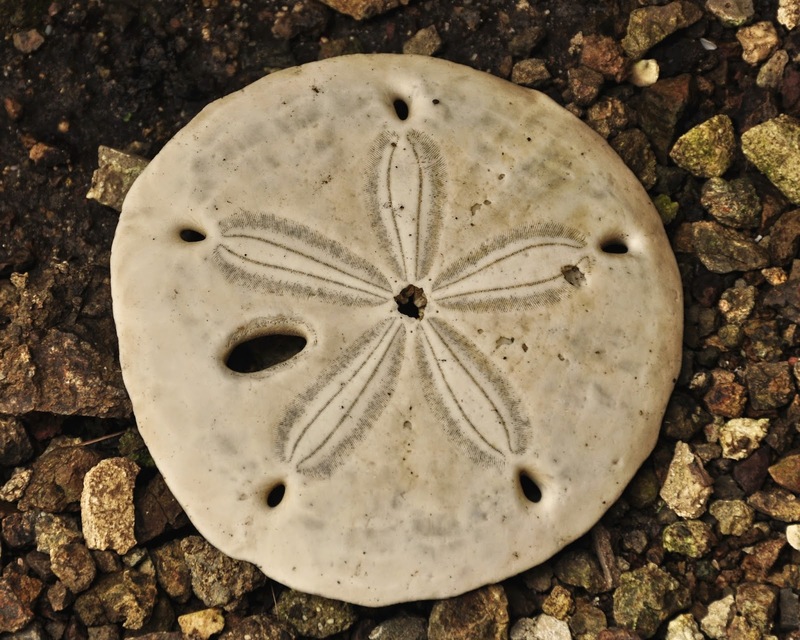 On Costa Rica there is a culture to leave shells on the beach, but people bring sand dollars up from the beach and put them in the rocks near where people rinse off by the swimming pool of our condo. The photo I posted yesterday showed me bending over to take photos of a baby iguana. Unlike the picture I posted several days ago looking down on the iguana, this is a photo from close to eye level. That is a much better vantage point for taking pictures of animals, and it is worth the effort even for 60+ year old knees. I like to take photos of my wife, Julie, taking photos, particularly while waiting for her to finish taking photos, which is often. This time she took a photo of me taking the photo of the baby iguana that I showed during the past few days. 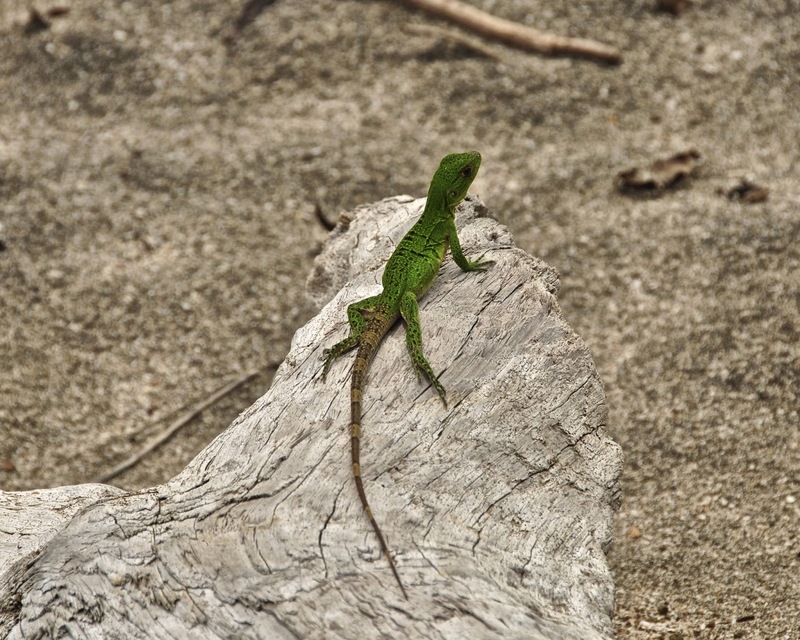 The piece of driftwood that I showed yesterday was a perch for this baby iguana. This is not a gecko. Geckos come out at night and have pads, not claws. Today is Sunday, so we have new photos posted on our Viva la Voyage travel photo site. This week we are showing photos of Rabaul, Papua New Guinea. 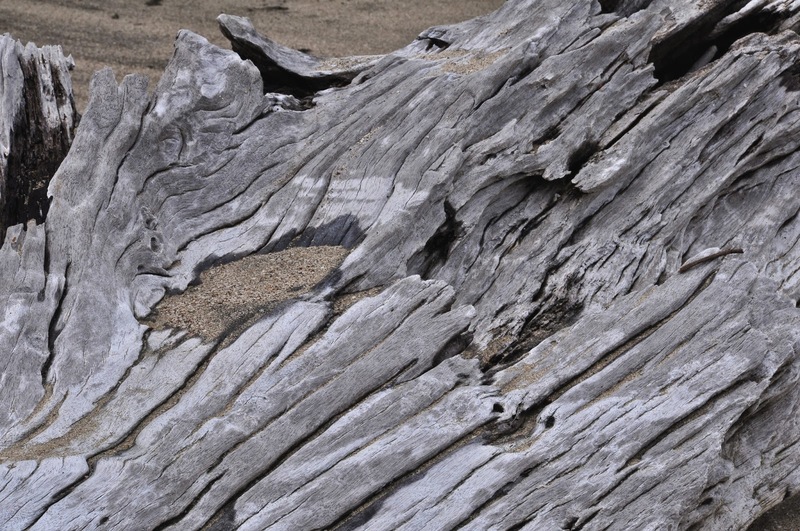 Langosta Beach is accented by driftwood, as there are lots of forests in the area near the estuaries and ocean. They don't add color, but they do add texture to walks along the beach. Tomorrow I will show what else they add. This week we have photos from our cruise in Mexico's Sea of Cortez posted on our Viva la Voyage travel photo site. 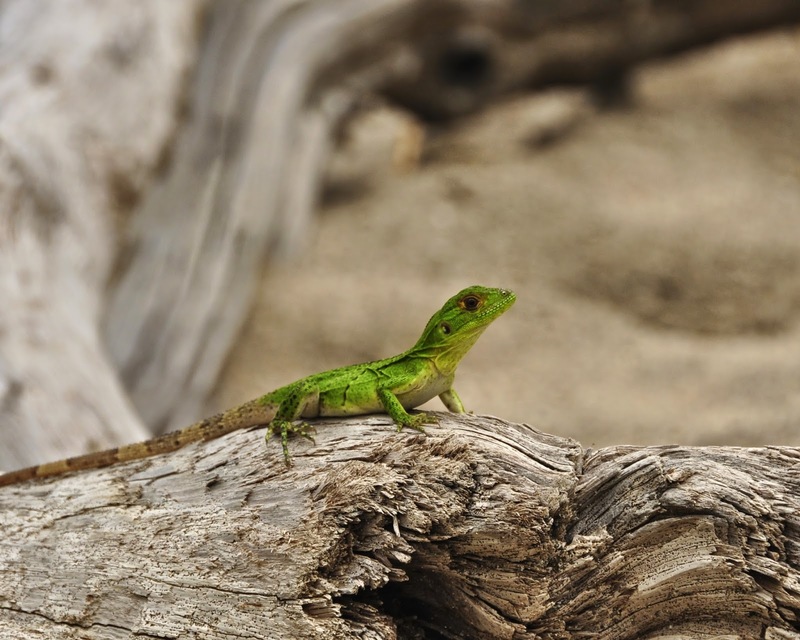 A closer view of the baby iguana. When taking photos of animals, it is usually better to try to get down to eye level. 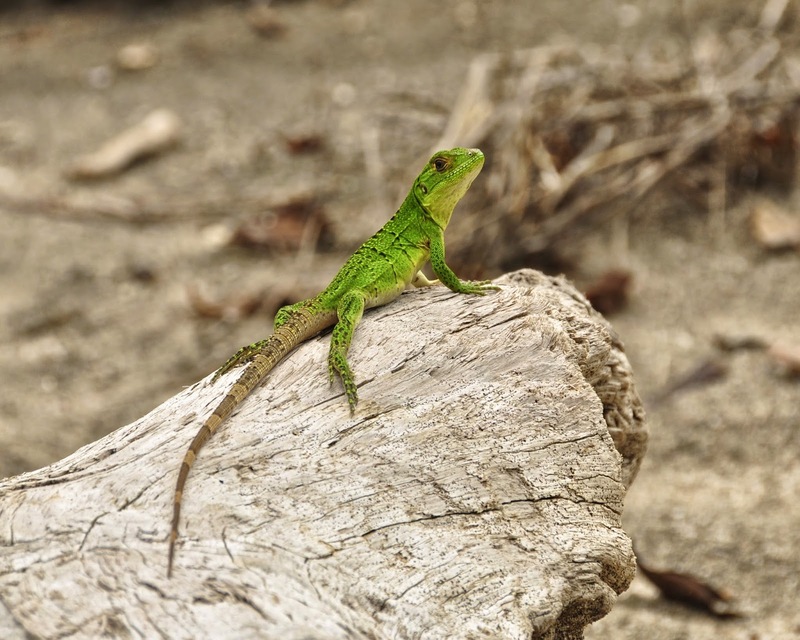 After taking my quick photo that I posted yesterday to make sure I got a photo without the iguana darting away, I moved closer and down to the level of the iguana. He did not seem to mind. 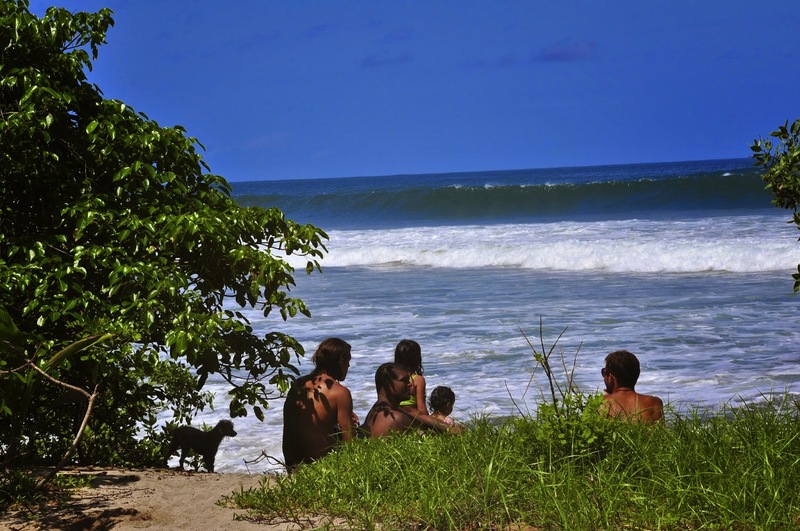 This family was enjoying a day at the beach on Playa Langosta, with several children and a little dog in the shade. 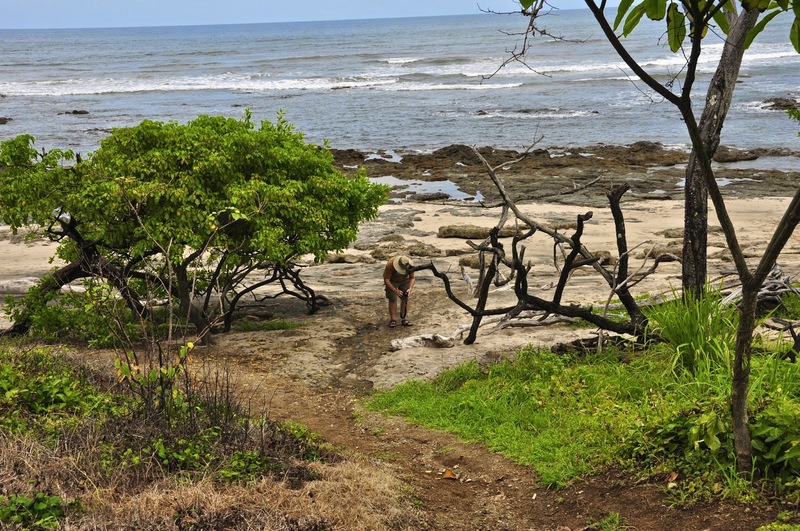 In Costa Rica all beaches are public. Everyone has an equal right to enjoy the beaches. 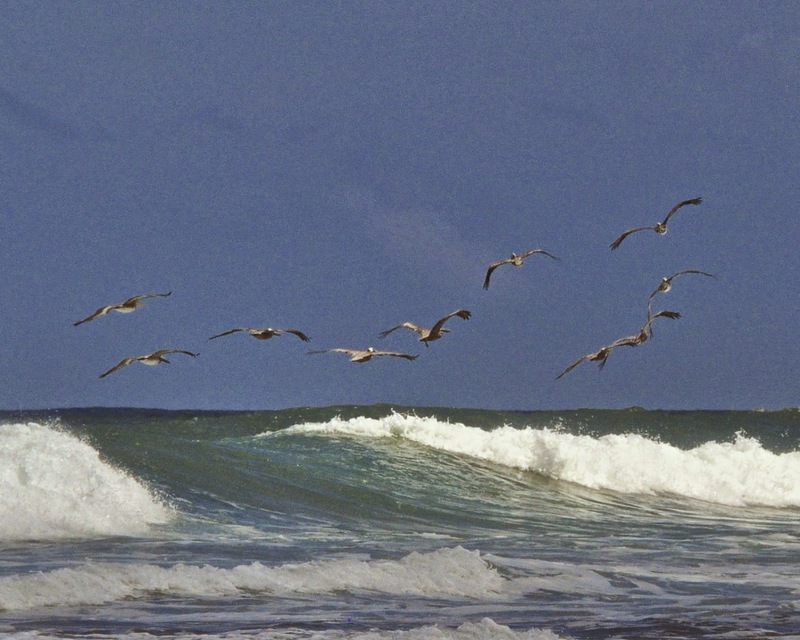 Usually when we see pelicans flying along Langosta Beach, a group of them fly by in a line or a "V" pattern. I don't know what happened, but this lone pelican flew by all by himself. Maybe he is a teenager who overslept in the morning. World Cup News: Tiny Costa Rica qualified for the World Cup Soccer/Football match and was placed in a group with three former World Cup champions -- Italy, England and Uruguay. Amazingly, Costa Rica won its first game, with a 3 - 1, come-from-behind victory over Uruguay. It's second game is tomorrow, and we will see if another upset can be achieved. If someone is looking for a pristine, unspoiled beach, this looks like just the place. It is crescent shaped beach with no houses or other developments. There also appear to be no roads to it, however. 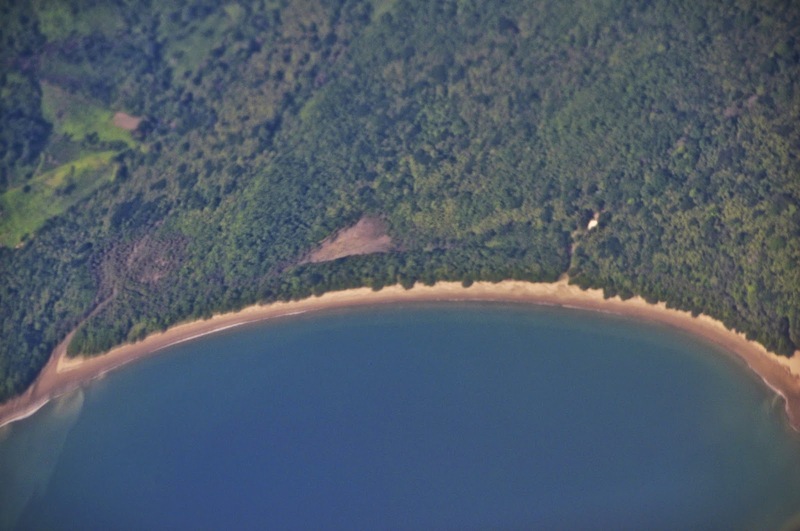 I took this photo from the airplane as we were heading down the Pacific Coast of Nicaragua on our way to the Liberia Airport near Tamarindo in northwest Costa Rica. 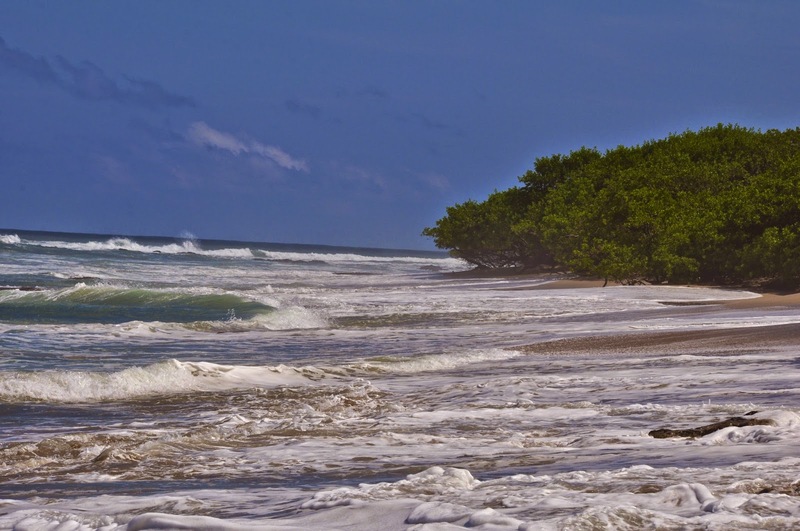 The coast of Nicaragua is much less developed than Costa Rica. Much of the reason is that the political climate in Nicaragua has been much less attractive to foreign investors than Costa Rica. Costa Rica has had a stable democracy since the late 1940's. Nicaragua's political climate has been turbulent. 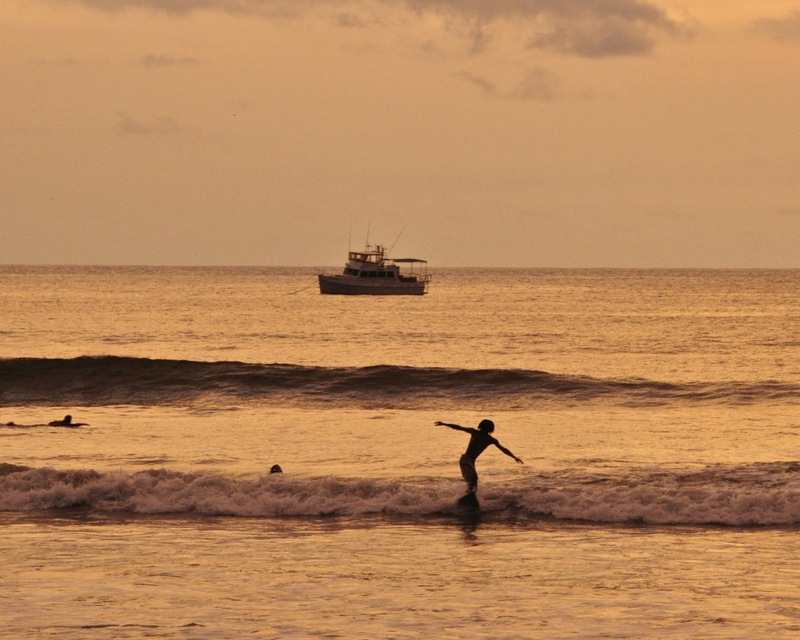 Evening in Tamarindo usually brings a walk to a restaurant and a walk home. There are night clubs, but we generally head home after dinner. 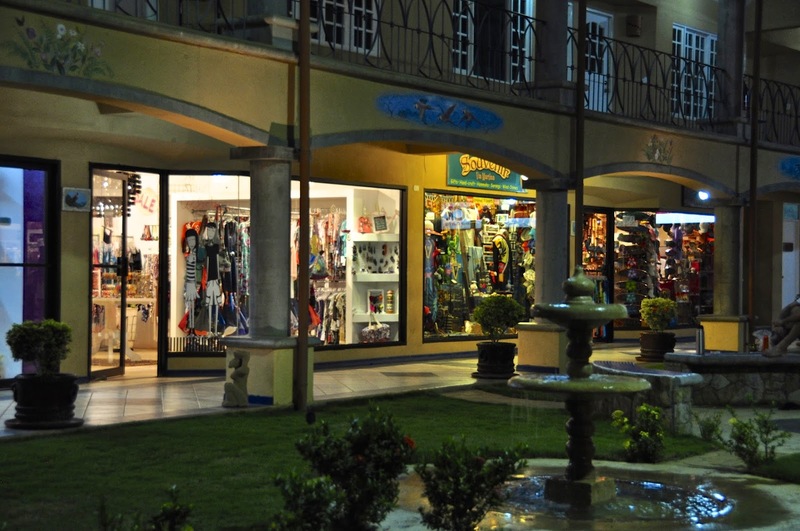 There are a few stores that are open late, like this lighted souvenir shop in the Plaza Conchal shopping center. 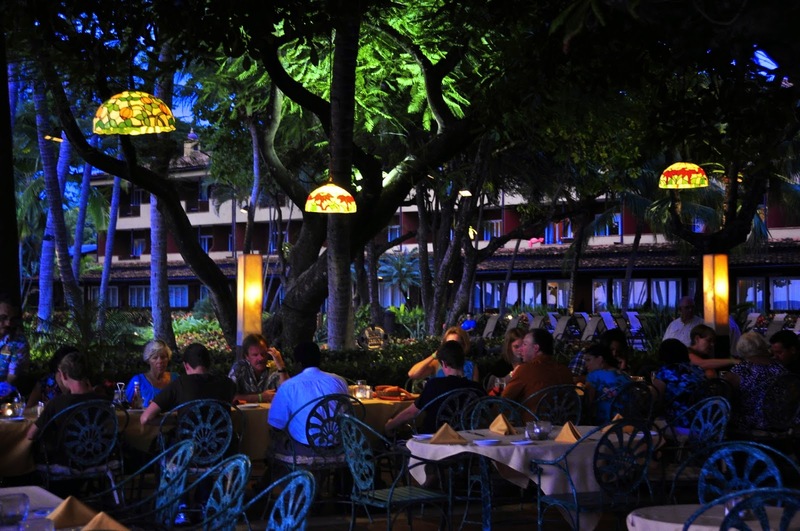 The restaurants in Tamarindo are open air, even restaurants that serve gourmet meals. This is Dragonfly, one of our favorite restaurants. It is located about a block of one of the main streets and is surrounded by trees and bushes. Tourists who stick to the main streets would not even know it is there. For Father's Day (in the USA) I am showing this photo of a Costa Rican father and son walking along the road in a rural area in the hills outside of San Jose. Boys will imitate their fathers, even at a very young age. Today is Sunday, so we have new photos posted on our Viva la Voyage travel photo site. This week we are showing scenes from a cruise that we took in the Sea of Cortez, just off the east coast of Baja California, Mexico. 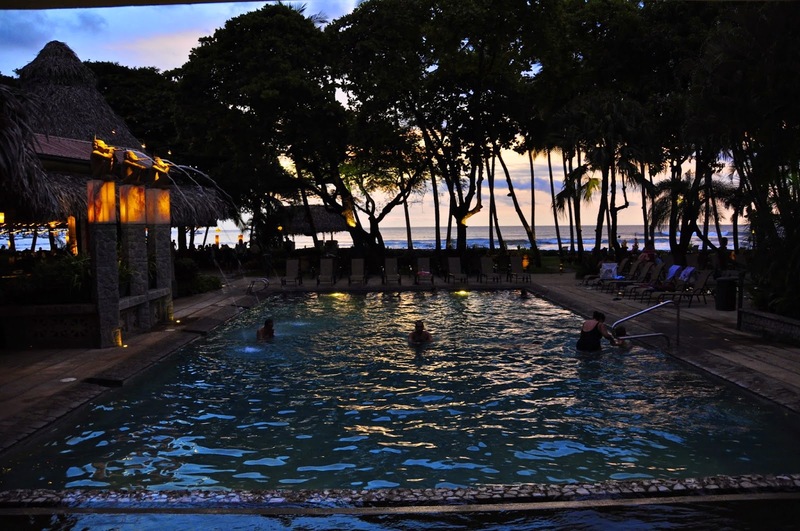 After sunset, a dinner at a beachfront restaurant is a pleasant way to end the day. 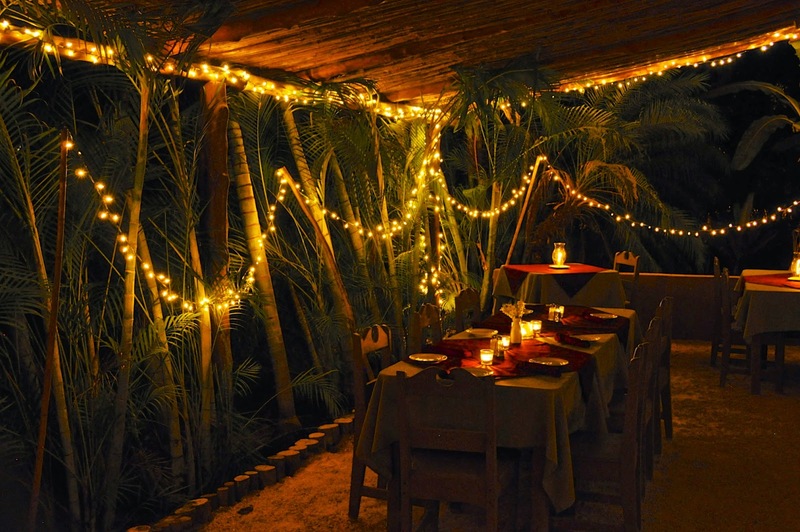 This is the outdoor restaurant on the beach at the Tamarindo Diria Resort. One of our two condos is part of this resort complex, which is the largest in town, by far. This surfer seems intent on getting in a few last rides of the day, very late in the day, as the sun has set. 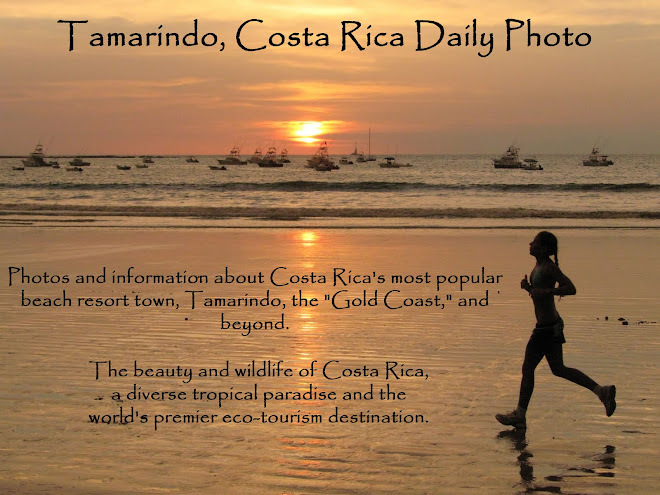 Costa Rica is known as a location for cute frog photos, and I have posted some of mine on tis website. 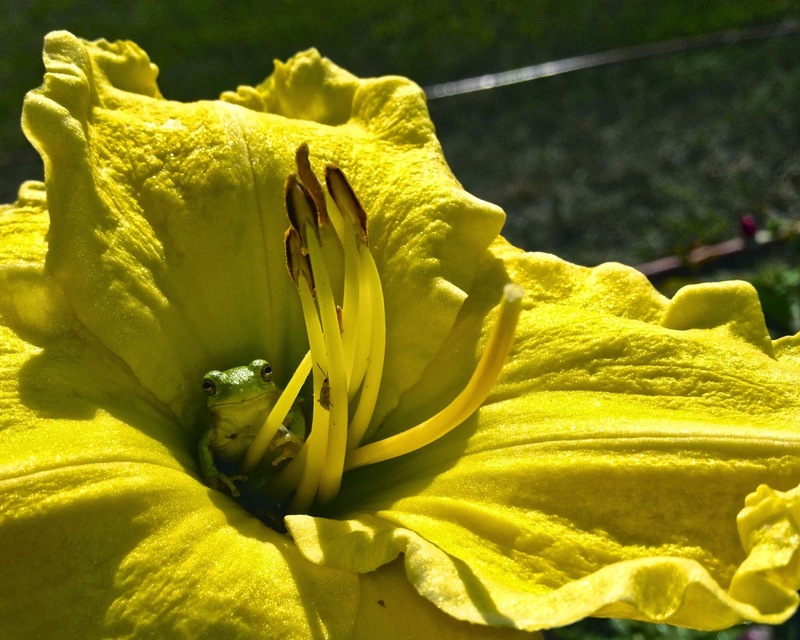 You can imagine my surprise when this weekend, while visiting my brother and sister-in-law in Minnesota, my sister-in-law showed me this cell phone photo she took of a frog in the middle of a day lily in their garden. She was tending to some of the many flowers in their garden when she noticed this tiny frog looking up at her from the center of a flower. He was probably hoping that she would leave him undisturbed. I guess she does not have to travel to Central America to enjoy cute frogs. She has them right in her yard. I took this photo a moment after the photo that I posted yesterday. The strong waves covered the sandy shore at this spot on the beach and reached the bushes that line the sore. 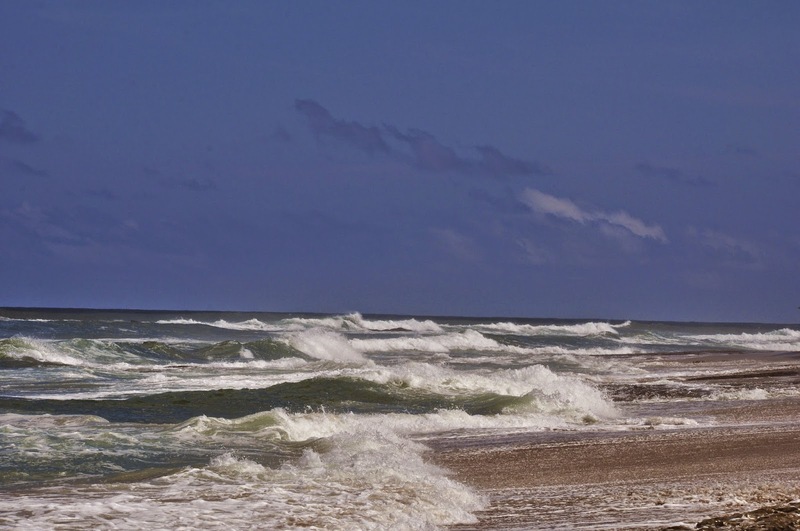 This is a view northward on Langosta Beach, in the opposite direction from where the surfers are. 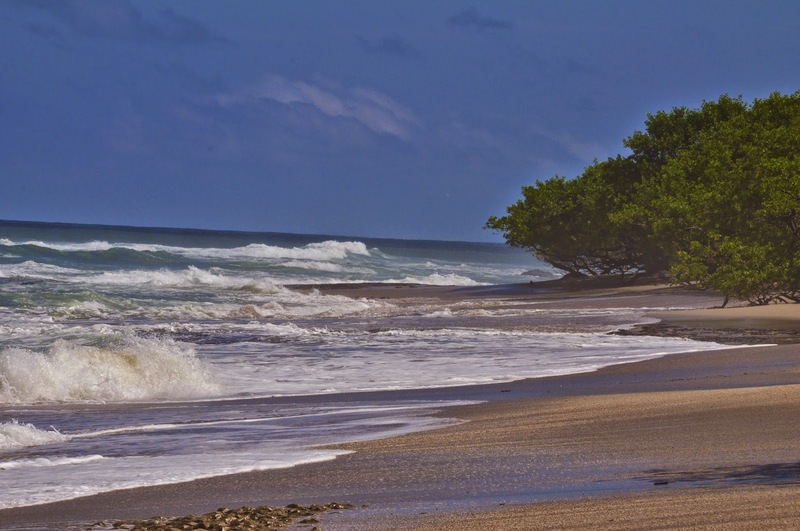 There are a few spots of Playa Langosta that are covered by waves at high tide, as I will show tomorrow. I am not a surfer, but I imagine that a decision point in the ride of any wave is whether to continue to ride it in towards shore, or whether to pull up and catch another wave. And when pulling up, do you find a calm way to dismount, if that is possible, or flip around and go airborne. 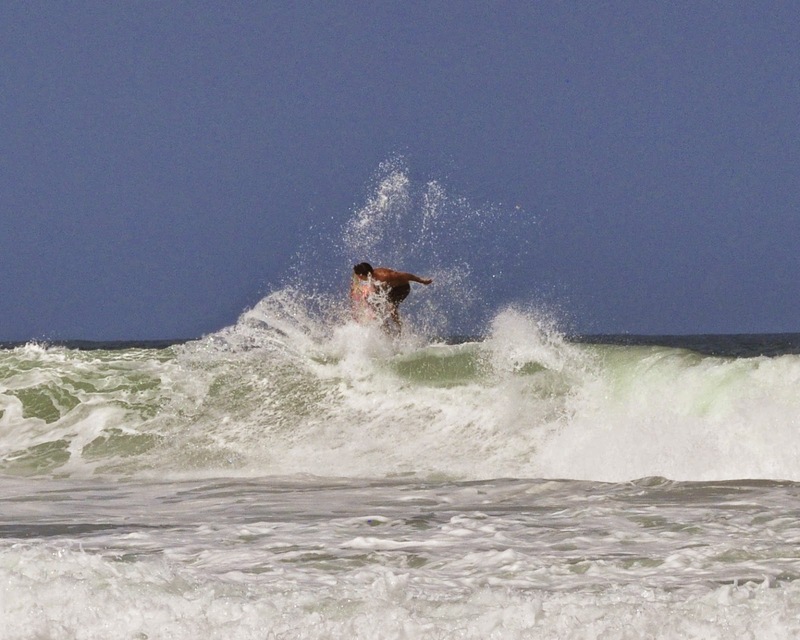 This surfer has chosen the airborne approach. Today is Sunday, so we have new photos posted on our Viva la Voyage travel photo site. This week we are showing photos of the Dalmatian Coast of Croatia. This pod of pelicans seems to have broken formation. Usually they fly in a line, or in a "V" pattern. This pod seems to have popped up in a bit of a disorganized fashion. And why not? They are at the beach and everyone else seems to be relaxing or on vacation. This week we have photos of the architecture of Budapest, Hungary, posted on our Viva la Voyage travel photo site. 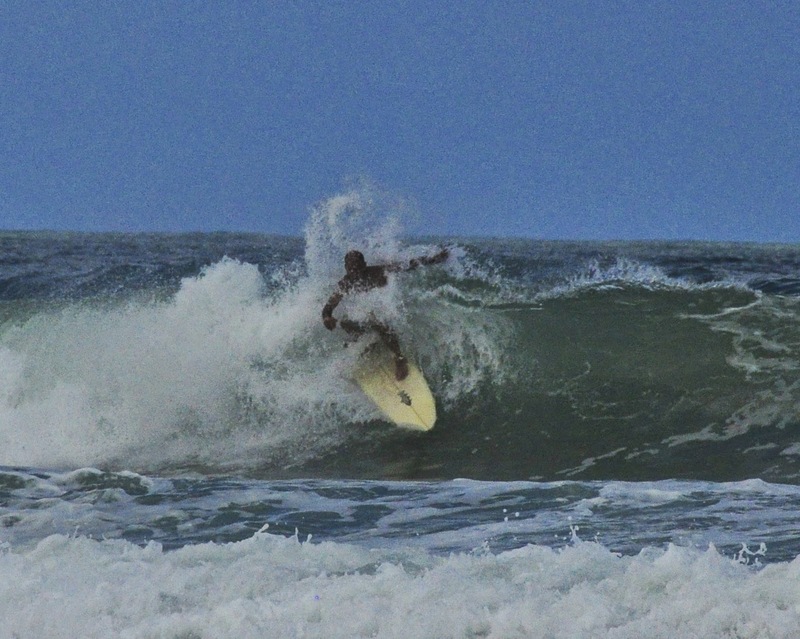 Here is another surfer on Langosta Beach. He seems to be caught up in the the middle of the wave rather than gliding across the top of the wave. 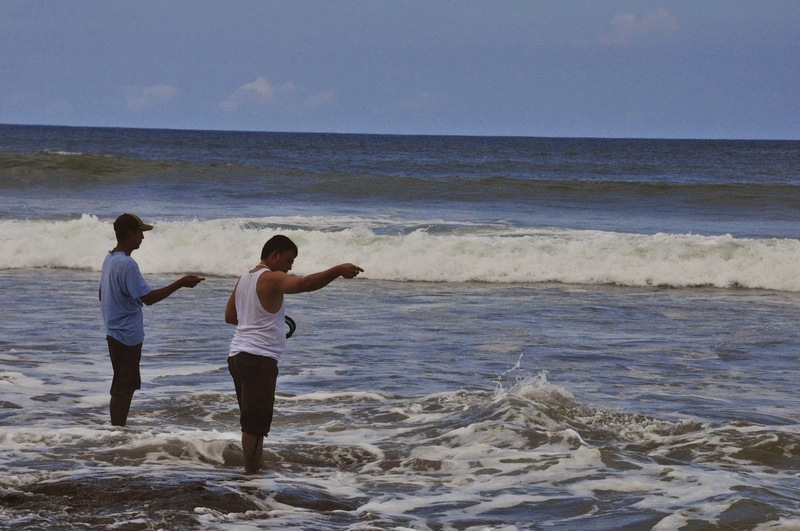 Surfing, fishing and swimming are not the only activities along Langosta Beach. 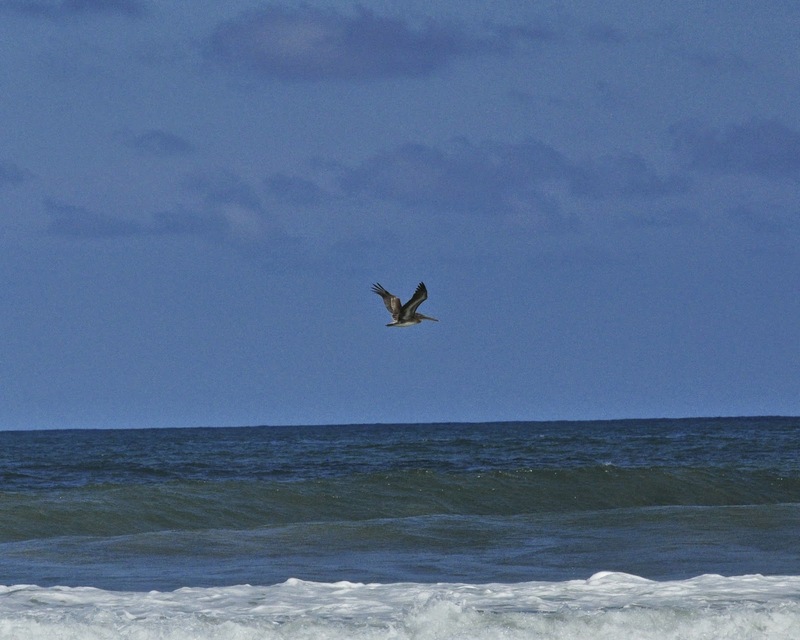 Pelicans regularly fly along the beach. 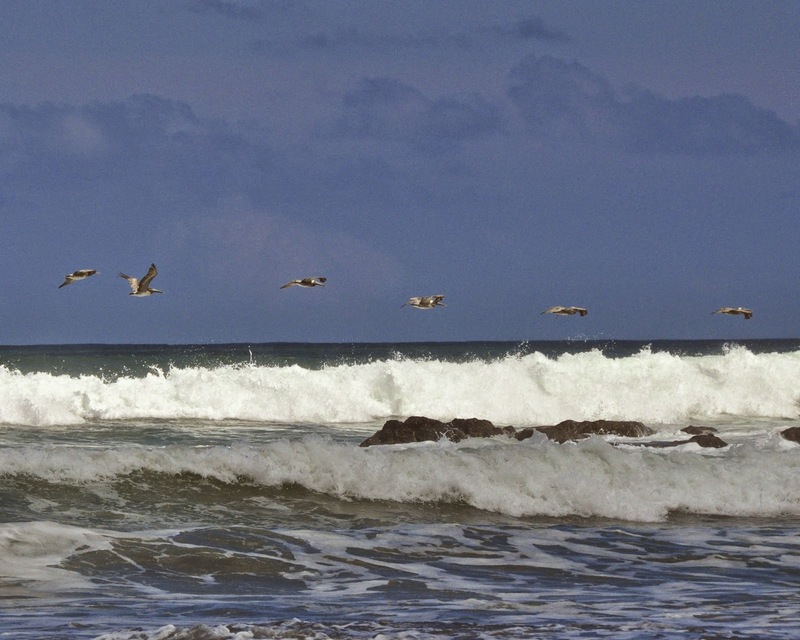 Sometimes they fly above the beach, and other times the skim along the top of the surf like the group in this photo. According to some brief internet research, a group of pelicans is called a pod. Surfers are not the only people enjoying Langosta Beach. These people were surf fishing, but they were doing it without a pole. Casting a fishing line out into the surf strikes me a tough to do with a fishing pole, but I cannot imagine how one could get a line out to where the fish are without a pole. The trick must be in the extension of the elbow demonstrated by these two fishermen. I took this photo a few moments after the photos that I posted yesterday and the day before. 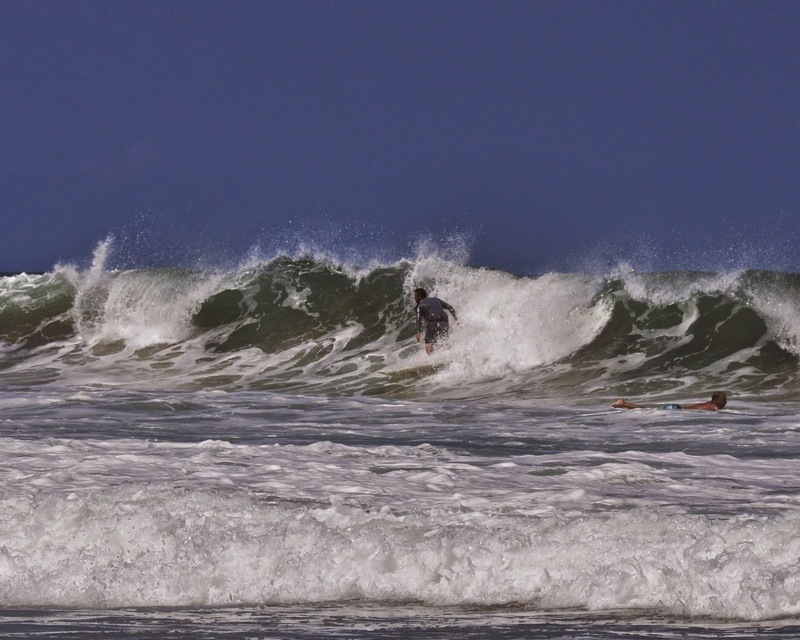 From shore, the waves where the surfers surf to not appear particularly large, but photos like this show that the waves are taller than an adult. I am content with watching the waves from shore. Today's photo is from the same spot on Langosta beach as yesterday's photo. I am not a surfer, but surfers regard the up flow of wind blowing off the top of a wave as a sign of a good wave for surfing. Today's photo shows a good example of that phenomenon. Today's worldwide City Daily Photo Theme for the first day of the month is "Zest." 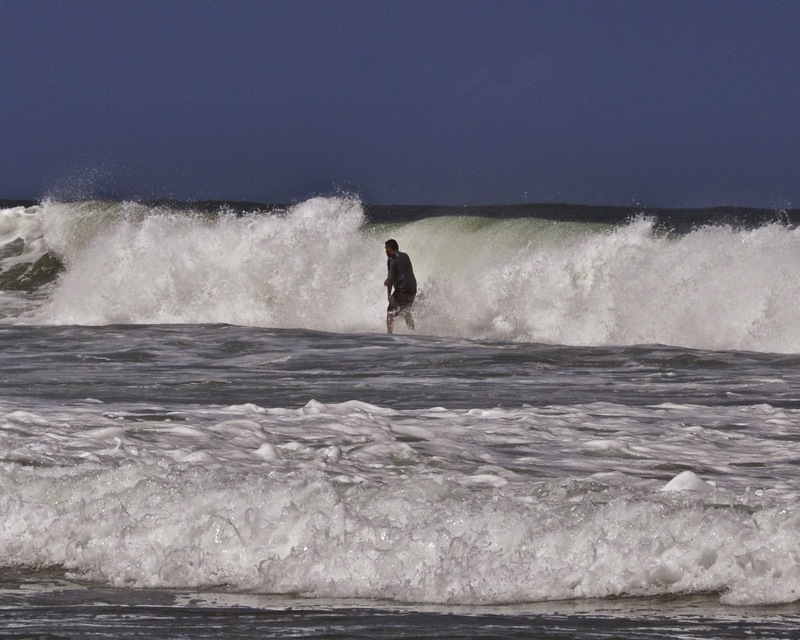 Today's photo shows the zestful energy of the ocean and a surfer. 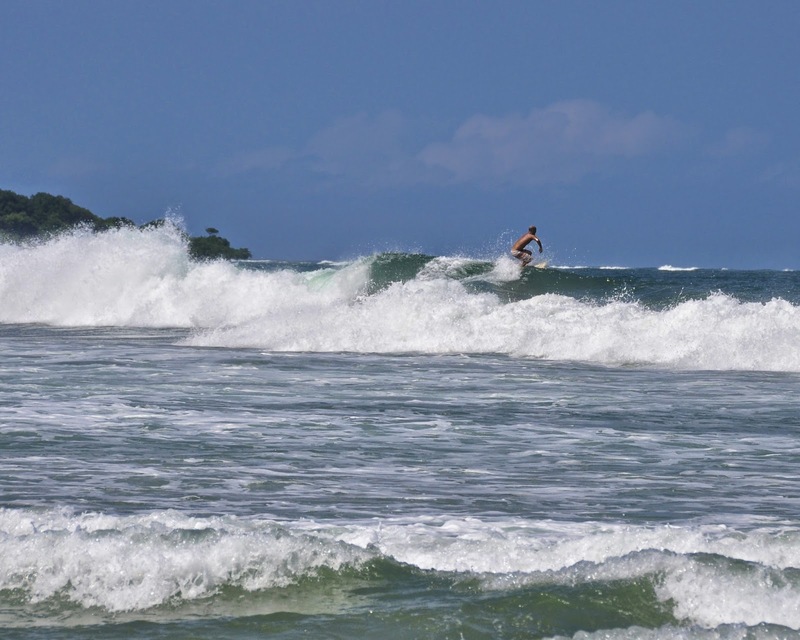 I have not shown many beach photos recently, and Tamarindo is a beach and surfing resort town, so I thought I would post a photo of the typical surf on Playa Langosta. Today is Sunday, so we have new photos posted on our Viva la Voyage travel photo site. This week we are showing photos of the architecture of Budapest, Hungary. To see how other City Daily Photo bloggers have interpreted today's theme of "Zest," please use this link.